Bellingham is well-known among travelers for its incredible setting and lively, college-town vibe. Delicious restaurants pepper the downtown district, and it’s hard to beat the views of the waterfront from along Chuckanut Drive or the walking trail between Bellingham and Fairhaven. Visitors flock to town from all over the state (and country) to enjoy the booming craft beer, coffee, theater and music cultures that have developed in Bellingham over the past decade. At the heart of this vibrant city is the up-and-coming Arts District, centered on Bay Street, just up the hill from the water and the exciting development work being done in the marina district. On any visit to town, it’s easy to spend an entire day exploring Bay Street and the myriad fun activities it has to offer. With that in mind, here are six must-try, family-friendly activities you can do without even having to walk three blocks. Let’s start at the top end and work our way south. Mount Bakery: Right at the north end of Bay Street, just across Champion Avenue, sits a true Bellingham icon: Mount Bakery Café. Come for the amazing breakfasts, including the famous salmon eggs benedict on a waffle, and be treated to friendly service in a hip, happy atmosphere. The locals love it (just check out these photos of the food to find out why), which is why it can get a bit busy at times, so stop by early! If you’re still hankering for coffee after you leave, check out The Black Drop next door for some of the best coffee in town. Pickford Film Center: The Pickford, as the locals call it, is a Bellingham treasure. It offers independent, foreign and documentary films in a wonderful arthouse cinema setting. It’s been a beloved evening event for Bellinghamsters and visitors alike for years, and it’s a true community organization. If you’d like to try a little live theater after the film, take a walk toward the water to The Upfront Theatre, which offers hilarious improv comedy down at the end of Bay Street. Woods Coffee: This spacious Woods Coffee location, on the ground floor of the Flatiron Building that encompasses the triangle created by Bay, Prospect and Champion streets, is another favorite hangout for locals. It features coffee roasted in the Woods Roastery across town, enjoyable in the relaxed, comfy environment typical of Woods Coffee locations around town. Not surprisingly, given that this is Bellingham we’re talking about, Woods isn’t even the only coffee shop on Bay Street. The recently opened Camber Coffee, on the corner of Bay and Holly, is another shop worth stopping by. 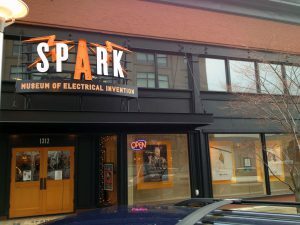 SPARK: The Spark Museum of Electrical Invention is a world-class museum situated next to the Pickford in the heart of Bellingham’s Arts District. Rare artifacts from the dawn of electrical experimentation (phrenology helmets, anyone?) sit next to authentic telegraph machines, telephones, and early experimental radios. There’s also the enormous MegaZapper Tesla coil, which creates 12-foot bursts of lightning on command. 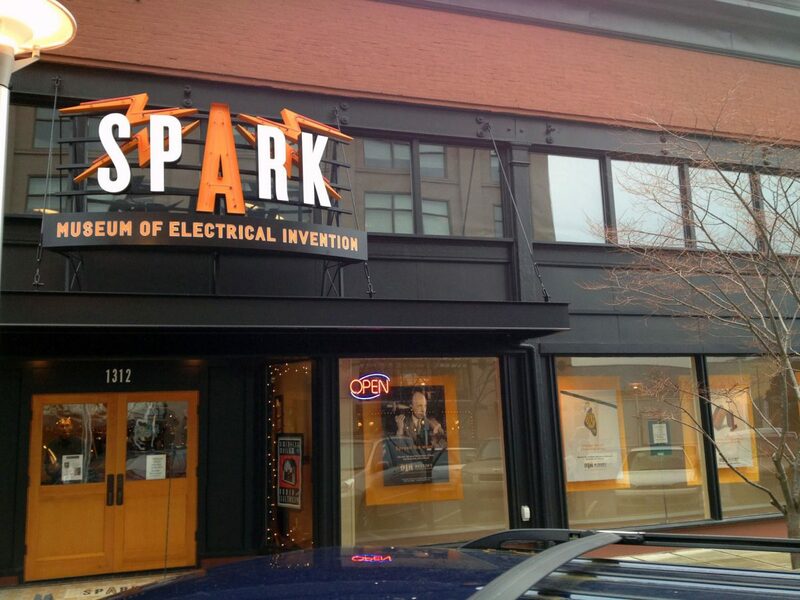 A longtime favorite of Bellingham locals, SPARK is a must visit for Washington State travelers, too. Bayou on Bay: For a decade now, Bayou has anchored the corner of Bay and Holly streets with its special brand of the New Orleans vibe. The restaurant specializes in Cajun, Creole and Southern cuisine, and it’s a favorite of everyone from the college crowd to the young urban families to the visitors looking for a memorable, delicious place to grab a bite. Brambleberry: The Brambleberry Handcraft Provisions store, which sits kitty-corner from Bayou on Bay, is a craft supply shop and much, much more. If you’re into soapmaking, or if you know someone who could use a unique gift this holiday season, Brambleberry is an absolute must. The shop sells every soapmaking item you could possibly want, and it also features classes and in-store crafting sessions. Bonus: Downtown Sounds, Bellingham’s hottest summer attraction, takes over Bay Street on Wednesday evenings all summer long with hot local and touring music acts. Come back during summer to check out Bay Street in a whole different light!